This post is a stop on the Virtual Book Tour for The Gift ofGiving Life. One of the aspects of The Gift of Giving Life that I enjoyed the MOST was that it truly validated that EVERY journey to motherhood is unique and special and that there is not a one “right way” to become a mother. 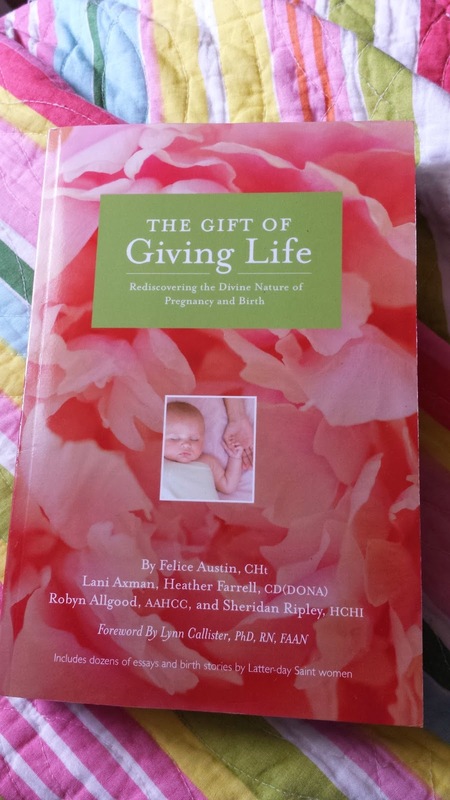 By the time I read The Gift of Giving Life I was eight months pregnant with my 3rd child and had already birthed two healthy babies sans pain medication in a hospital setting with fantastic OBs and L&D nurses whom I still recommend to women in my area looking for supportive care providers in a hospital birthing environment. I felt like I was an “experienced” mother and knew what to expect. The only reason I had heard of this book was because summer 2012 we were traveling to Oregon to visit my husband’s family and to break up the trip we stayed in the Boise area with my dear friend *Katy Rawlins (who at the time was a student midwife with Treasure Valley Midwives but is now a Certified Professional Midwife). As a birth and post-partum professional, she had been asked to contribute an essay of her first daughter’s birth to the book. She had recently received the proof copy of the book when we were visiting. 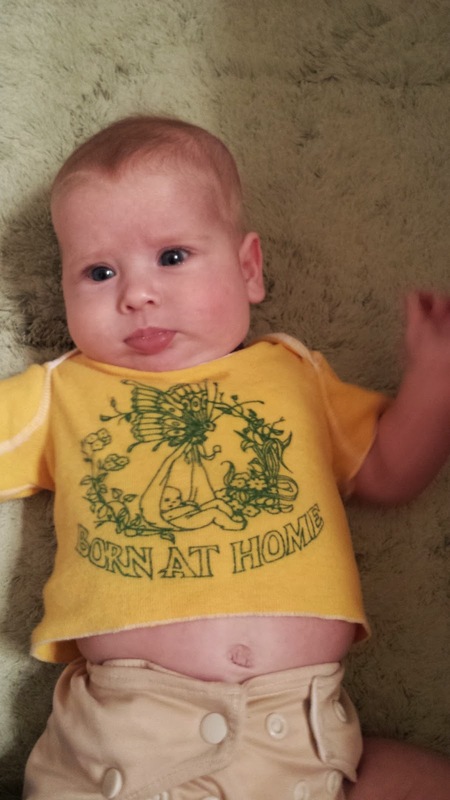 About six months prior to the 2012 summer trip to Oregon, I had begun to feel VERY strongly that I needed to birth my next baby at home. I had some hesitations because of my vasal vagal syncopes and I wondered if I would be considered a “high risk” to a homebirth midwife – so in discussing this with Katy that one night (where we stayed up way too late), she alleviated those fears and told me the midwife she was apprenticing with would not consider my condition high risk. A couple of months later I got pregnant and around 8 weeks I was so severely dehydrated and nauseated that I ended up having a vasal vagal syncope – something I hadn’t experienced in over 8 years. It was a very scary time to be pregnant and have a vasal vagal syncope and the thought “perhaps I should have my baby at the hospital” crossed my mind. Throughout the second trimester, every time I considered calling my OB’s office and planning a hospital birth, I felt uneasy. Logic would tell me it was “safer” to birth my baby at the hospital with a doctor and medical equipment, but my spirit/intuition (or my “gut”) was telling me to birth at home with my midwife team. Oddly enough, this experience of debating between birthing at home with my midwife, or birthing at the hospital with my OB, was VERY similar to an experience I had had nine years previously. I had been told, in very specific terms, that I would marry Marc after returning home from my 18 month LDS mission. Marc and I had been writing for just over 2 years at this point and we had never met in person. My Logic (and family members) told me that I should date him in person before making that decision. But the Spirit kept telling me that it was the right decision to marry Marc even though we had never been in the same room together. Because of the doubt we had received from family members on both sides during our “engagement” period, we only told a few family members that we were planning a home birth. Marc’s mother was totally supportive of it since she had birthed Marc at home. My mother was VERY hesitant and it took a few months of me sharing with her how I felt anxiety when I thought about birthing at a hospital this time around but I felt PEACE when I thought about birthing at home before she stopped feeling anxiety for me. My copy of the book, which arrived exactly one month before my birthday and 7 days before my daughter decided to start the process of her birth. I was due mid-July, so in June (after NOT receiving The Gift of Giving Life for Mother’s Day as I had suggested), I told my husband he needed to get me the book as an early birthday present – my birthday being 2 weeks after the due date in early August. He ordered it for me and I read through most of it before our daughter was born. I think that in this 3rd journey to motherhood, I needed this book at this time. The stories shared in the book validated for me the strength and confidence that comes when you rely on following the impressions of the Spirit concerning your child’s birth – whether those promptings include a scheduled c-section or a medicated hospital birth or an unmedicated home birth. I felt even MORE confident in my decision to birth this child at home with my very competent direct-entry midwife and my licensed midwife. Again, contrary to most home birthing women, I wanted the option of having an IV at my homebirth and since I needed both pictocin and methergine to stop the bleeding after the birth of my 2nd child, I knew we should be prepared in case I needed it again and so I wanted a licensed midwife there, and so we made sure that Angie Blackett would be there and she was! This is one reason I wish we had hired a doula for our first child's birth. This counter-pressure technique would have come in handy for that labor! The confidence and intuition was not misdirected. After a PERFECT labor both before and while in the birthing tub, it was actually a pretty difficult labor for me once I got to what I thought was my favorite part, pushing. In between contractions I was telling the midwives and our photographer Susan how Marc and I "met", realized we were supposed to get married after my mission and then met in real life. My oldest daughter (2nd birth) had slipped out after pushing non-stop for 3 minutes in the hospital – and that was with the cord wrapped around her neck which the doctor had to slip over her head while I was pushing. I expected that my 3rd baby would come just as easily. I was wrong. After I started feeling the urge to push and started pushing, my baby was not coming. So Sherri had me stand up and rotate my hips. I squatted back down in the birthing tub and began to push once again. This time my daughter started to come. I experienced the “ring of fire” just getting her head out. But then she didn’t slip out like my older daughter had. She was stuck. The push that finally got her head down. At this point, one of the essays/chapters from The Gift of Giving Life that had been in my mind once I started pushing came to the forefront of my mind. I can’t look up the chapter or exactly what it said since I have loaned my copy out, but it was the essay on how birthing is in similitude of the Savior’s Atonement. It went far beyond the “water, blood, spirit” birthing connection and noted that each child can ONLY be born through the efforts of the mother. Just as the Savior was the ONLY person who could redeem us from our sins, I am the ONLY person who can birth the child in my womb. I have to do for her what she could not do for herself – and that is to birth her. It was only after reading this chapter and reflecting on the birth of my first child that I understood why women often refer to the birthing experience as “walking through the valley of the shadow of death” (Psalm 23:4). I felt that even more so during this third birth. As it turned out, she was stuck because of shoulder dystocia – her shoulders were stuck behind my pelvis. Sherri reached up and rotated her shoulder while I was pushing and once that occurred I could finish pushing her out and into the water and Sherri caught her and brought her up out of the water right away. At 9 lbs 8 oz, it is no surprise now that she got stuck. She also had a lot of mucus they had to clear out of her before I could hold her, but I am so grateful for my competent birthing team of midwives and Marc. One of the many times they were suctioning mucus out of her airways. The tubing is oxygen. It was a good thing that Sherri also called Roxanna to come because while Sherri and Angie were taking care of me, Roxanna was working on Cassie. I know my baby was born where and when she wanted to be with whom she wanted in attendance, including her sleeping older sister who was sleeping on our bed and her older brother who woke up and was awake for her entrance into this world. 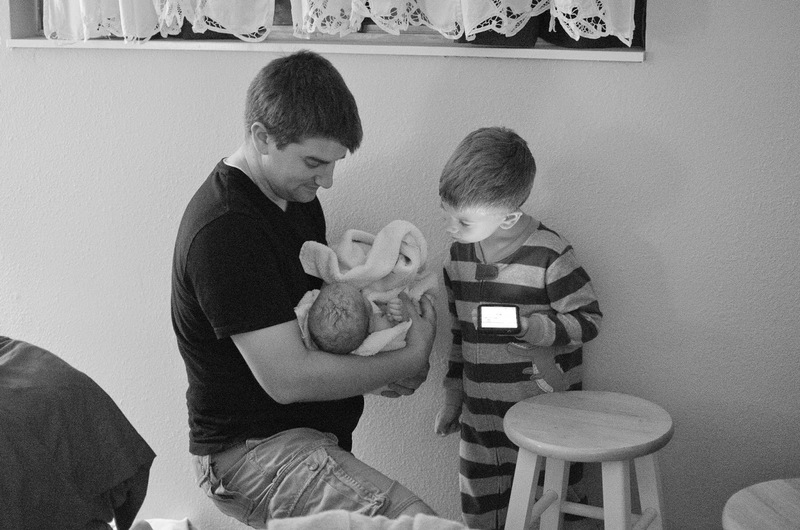 Getting a closer look at baby sister. I like to say that since Marc was born at home, she wanted to have that in common with her daddy. Apparently the first time Sherri has had the daddy do skin-to-skin contact.... I was unavailable since Angie was getting an IV in me and she was working to stop the bleeding with a shot of pictocin and methgerine. I'm SO thankful we had Angie there which was another part of following my intuition for this birth! Wearing her daddy's "Born At Home" shirt 31 years after he did (she is almost 4 months old in this picture since that is when I came across this shirt Marc's mother had given to us). The other perfect timing to read this book when I did was not entirely for me, it was for my friend Krystal. She was due about 2 months after me in September, but at her 20 week ultrasound right around Mother’s Day, she and her husband learned that their 3rd child had Potter’s Syndrome. This meant that his kidneys didn’t form and therefore his kidneys were not producing amniotic fluid for him. His heart was enlarged from working so hard and his lungs were underdeveloped since there was no amniotic fluid to help him practice breathing. They learned that IF he survived in the womb long enough to be born and IF he survived labor, his birth date would also be his death date. Their angel baby Kale Link experienced mortality for 35 minutes only five days after my Cassie was born. 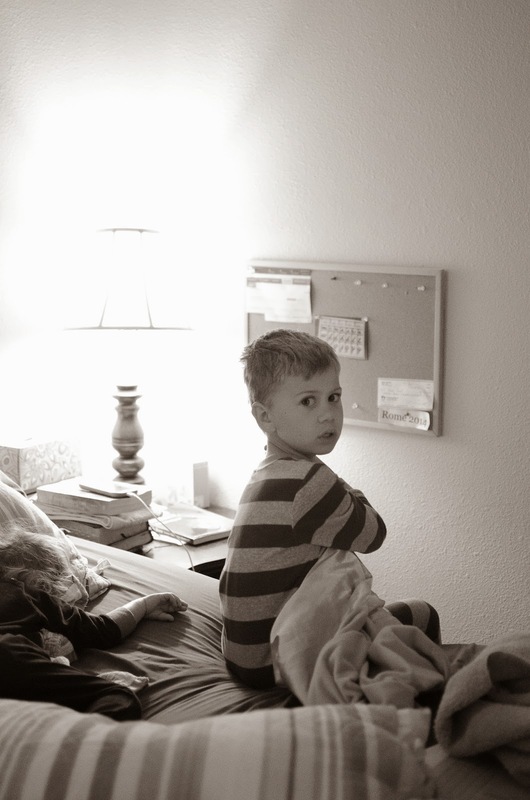 At a time when I was experiencing the euphoria of having a newborn, my friend was mourning the experiences she didn’t get to have with her son. As I continued to read the book after Cassie’s birth, I was able to share with Krystal chapters that I felt would help her through her grieving process. I asked her later if I was remiss for just e-mailing her a chapter I had read (I scanned it and e-mailed it to her as a pdf) without knowing if she really felt up to reading anything like that in the moment, and she told me that what I had sent her was perfect. She needed to know that it was okay for her to feel the full range of emotions she was feeling. I learned from those grief chapters what NOT to say to a grieving parent and what to DO for a grieving mother. I think the sensitivity I gained from this book has helped strengthen our friendship. I felt more confidence in mentioning Kale in our conversations rather than being afraid to talk about him in an effort to protect her emotions as I may have done before reading the chapters in this book that dealt with mourning the loss of a child. He is not a taboo subject when we are together. I am SO thankful for The Gift of Giving Life book. It is so much more than just birthing stories and I honestly believe that anyone would benefit from reading this book, even if their childbearing days are over, or not yet begun, or they incapable of having children. This book covers the ENTIRE spectrum of the spiritual aspects of birth: infertility, IVF, miscarriage, stillborn, placing a child for adoption, growing your family through adoption, cesarean births, hospital medicated births, hospital un-medicated births, home births, and losing a child and SO much more. 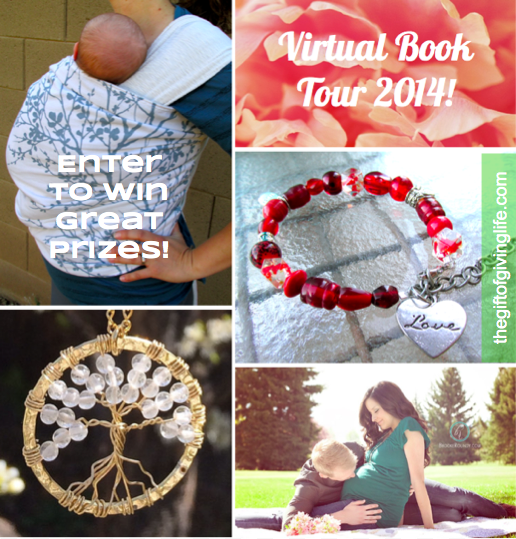 Visit the Gift of Giving Life Virtual Book Tour page for a chance to win some great pregnancy/birth/baby-related prizes! (All black & white birth photos were captured by the fabulous Susan Monson). *Edited to update Katy Rawlins' Treasure Valley Midwives profile from the "Student" page to the "Midwives" page. Robyn's essays are awesome! So glad they were helpful to you and your friend. What an amazingly beautiful story- thank you for sharing.